Murder by Gaslight: The Ruttinger Mystery. 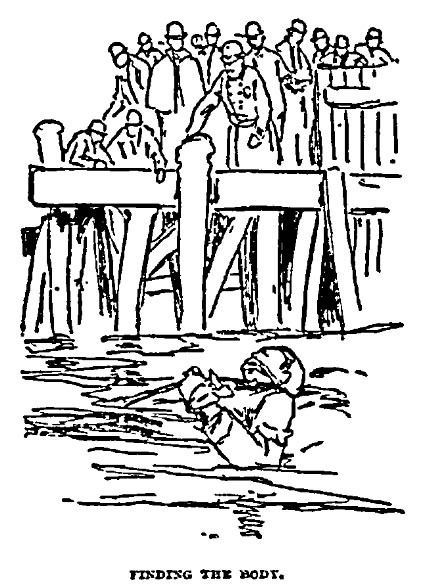 Samuel Mortin, who was employed to keep watch over six coasting schooners laid up for the winter just below Tottenville, Staten Island, New York, found the body of a man lying in the mud, half floating, next to one of the vessels on March 11, 1891. The man's arms were crossed behind his back tied together at the wrists and above the elbows with heavy packing twine. Mortin secured the body and went to tell the police. An autopsy revealed that the man had not drowned but had died of strangulation. 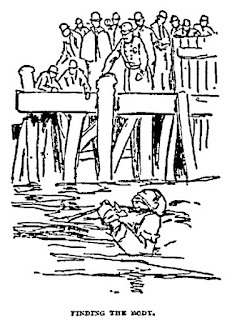 The body had probably not been killed where it was found but had been carried by the tide from somewhere else, but it had not been in the water more than four or five days. He had been about six feet tall, weighing 200 pounds, powerfully built, but his hands were soft, and he was fashionably dressed. If robbery was the motive, the thief left behind a gold and platinum watch chain and other pieces of jewelry. 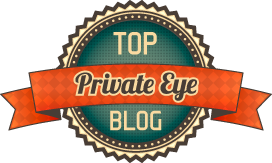 There had been no attempt to hide his identity; in his coat pocket was a passport issued by the Royal Police Department of Saxony, to Karl Emanuel Ruttinger, Jr. There was also a receipt for a registered letter from England to Ruttinger at an address in Stuttgart, Germany. Both documents were dated December 20, 1890. As the investigation into Ruttinger’s murder progressed, the mystery surrounding the case grew ever more dense and each new discovery prompted more questions than it answered. In his pocket were numbered receipts for two ferryboat tickets from Tottenville to Perth Amboy, New Jersey which had been sold on February 2, for two people. The tickets had been used, presumably soon after their purchase, but if the body had only been in the water four or five days, where had he been in the month between? A big German stranger would have stood out in both Tottenville and Perth Amboy, but no one in either community remembered seeing him. The other question raised by the tickets was who used the second ticket? That question was answered when a boarding house keeper named Gustav Neu went to the German Consul’s office with information on Karl Ruttinger. Ruttinger had come to his house on January 10 and shared a room with a young Englishman named Wright whom he introduced as his wife’s brother. Neu was questioned by New York City Police, and he told them that Ruttinger was a lace salesman and expert from Dresden who had come to America to find employment. He was an educated man who spoke German, English and French fluently. Wright, whose first name Neu did not know, was a diamond setter. On January 26 both men traveled to Boston and returned three days later. On February 1, Wright packed his bags, paid his bill and left again for Boston where he said he had found employment. The next morning Ruttinger left the house early, leaving his things in his room as if he expected to return that night. Mr. Neu never saw him after that. On the passenger list of the steamer City of Chicago, which arrived in New York on January 10 from Liverpool, were the names Charles Ruttinger and William Wright. Of course, it was lost on no one that the initials on the handkerchief stuck in Ruttinger’s throat were "W. W." Wright, who could not be located, was now the prime suspect in Ruttinger’s murder. But William Wright, aged 28, was described as five feet, four inches tall weighing about 120 pounds there was no way he could have overpowered a man of Ruttinger’s size and build. Did he have an accomplice? In any case, there was now a pressing need to locate William Wright, and his description was sent to Boston and every other city within reach of the telegraph wire. On March 15, a man, whose name was withheld from the press, visited New York Police Headquarters with additional information on Ruttinger and Wright. He had known the Ruttinger family in Germany, and he confirmed that Karl Ruttinger was a lace manufacturer, well-educated and well-traveled. On a trip to London, Ruttinger became acquainted with the Wright family, and subsequently married the daughter, Madge Wright. The family was well-to-do and Ruttinger’s new bride had a healthy income of her own. Her brother William—who the informant described as “an idle, cigarette smoking, bicycle riding young man”—accompanied the newlyweds when they moved to Germany. Since then, Ruttingers had two children, and they were all living with Karl’s mother in Stuttgart. Madge Ruttinger had not been heard from since Karl’s death. 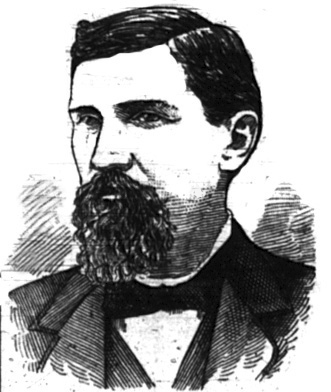 With the police unable to locate William Wright, speculation grew that he was dead as well. Mr. Neu, their landlord during January, did not believe that Wright was the killer. He was a mental as well as a physical weakling, Neu said. He couldn’t have planned anything so intricate as the murder and couldn’t have executed it if he had a plan. He also said they had been inseparable when he knew them and felt if Wright were alive he would have written long ago to inquire about his friend. The theory that Wright was dead was given a boost when people began to notice that Wright’s description matched that of an anonymous man who committed suicide in the Astor House on February 2. The man who checked into the Astor House under the name Fred Evans was short, slightly built, and spoke with a strong English accent. He carefully destroyed everything that could lead to his identification, stripped to his underwear and cut his own throat. Among Ruttinger’s effects were some photographs of himself and Wright. When shown the photograph of Wright, members of the hotel staff were convinced that he and Evans were the same person. Likewise, Gustav Neu was positive that Wright resembled a photograph of Evans. The shoes of the dead man were German, and the back of the uppers had “W.W.” scratched into the leather. The collar worn by Evans was marked “Pluto, 15-3s” and collars left at Neu’s house were also marked “Pluto, 15-3s.” Inspector Byrnes of the New York City Police considered this conclusive proof that Evans was Wright. It was now speculated that Wright had killed himself out of remorse for killing his brother-in-law, or that it had been a suicide pact and after assisting Ruttinger’s suicide had taken his own life. Around the same time, Gustav Neu received a letter from a man in Rochester, New Hampshire, saying that a man with an English accent who fit Wright’s description took a room at his boardinghouse on February 25. He spoke of setting up a business in Boston with goods coming from Germany and seemed to take an unnatural interest in news of the Ruttinger murder. Witnesses in Boston said a nervous man who fit Wright’s description left town on a cattle steamer. Inspector Byrnes may have believed one of these clues or he may have had new information that he was not sharing, but five days after saying conclusively that Wright was the Astor House suicide, he was now saying he believed that Wright was still alive. Others went so far as to say that Ruttinger was also still alive. It was discovered that Karl Ruttinger’s life was insured for more than $20,000 with a $10,000 policy purchased just one month before the trip to America. It may have been an elaborate plot to defraud the insurance company, with Ruttinger and Wright already hiding out in Europe awaiting payment. The body discovered in Tottenville was not Ruttinger’s; some believed it was the body of a man named Schneider, first mate of the German oil ship Mommsen who was missing when the ship left Perth Amboy for Copenhagen. On March 31, 1891, an inquest was convened in Tottenville to hear testimony from everyone with direct evidence in the murder case. Among the witnesses was Dr. Caleb Lyon, the doctor who performed the autopsy who said that in his opinion Ruttinger had committed suicide with the aid of another person who bound his arms after death. The jury returned the verdict that the body was that of Karl Emanuel Ruttinger and that he was suffocated at the hands of a person or persons unknown to the jury. Though the investigation continued, no evidence was ever uncovered to revise that verdict. In February 1892, the Equitable Life Assurance Society paid $22,000 (in German marks) to Mrs. Therese Ruttinger, mother of Karl Ruttinger. Statements made by the insurance company implied that they were not convinced that it was not suicide or other fraud but decided it was cheaper to pay the claim than to continue investigating. “'W W,' New York Herald, March 14, 1891. “Again All Theories Fail in the Ruttinger Mystery,” New York Herald, March 21, 1891. “Charged With A Crime,” Trenton Evening Times, March 26, 1891. “Little Doubt Remaining,” New York Tribune, March 18, 1891. “Mrs. Ruttinger Disappears,” New York Herald, March 18, 1891. 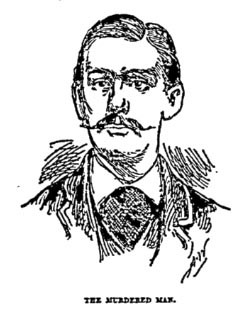 “Murder and Then Suicide Fit Wright's Character,” New York Herald, March 20, 1891. “The Mystery Thickens,” New York Tribune, March 13, 1891. “Now the Theories Have Wright Alive,” New York Herald, March 23, 1891. “One More Mystery in the Strange Case of Carl Ruttinger,” New York Herald, March 17, 1891. “Probably Ruttinger and Probably Not,” New York Herald, April 1, 1891. “Puzzling Mysteries of the Arthur Kill Murder,” New York Herald, March 13, 1891. “Ruttinger's Life Insured for $21,000,” New York Herald, March 16, 1891. “Ruttinger's Policy Paid,” New York Herald, February 16, 1892. “Suicides Both,” Evening World, March 18, 1891. “A Verdict In The Ruttinger Case,” New York Tribune, April 1, 1891. “Wright May Have Died with Ruttinger,” New York Herald, March 15, 1891. “Wright Resembled Evans,” New York Tribune, March 17, 1891. “Wright Seemed Then on the Verge of Despair,” New York Herald, March 22, 1891.